Why did the University of Cambridge honour Goodhart by establishing a chair in legal sciences in his name in 1971? There may have been several reasons: he was an eminent lawyer and legal scholar, he had been both a post-graduate student and lecturer at this university, and, probably most significantly, he had been (and at the time remained) a remarkable advocate of strengthening cordiality and understanding between his native USA and his adopted home, the UK. All in all a remarkable man, whose ties with legal academia in England still retain several unique features. Merely in his name, Goodhart reveals a fascinating pedigree. His father, Philip Goodhart, was a millionaire stockbroker, while he had the Lehmans on his mother’s side. One uncle, Herbert Lehman, was governor of New York State and later its senator, while another, Irving Lehman, was Chief Justice of the New York Court of Appeals. Although born in New York in 1891, and remaining a US citizen all his life, Arthur Goodhart spent most of his adulthood, and devoted most of his energies, to his career in England. Legally trained at Yale, he first arrived in Cambridge in 1912 to study economics at Trinity College, but was persuaded to study law instead. His attachment to his new home was evident when he volunteered for service at the outbreak of the First World War, but happily for posterity he was turned down, and only got his chance to serve when the USA joined the War in 1917. Persuaded to return to Cambridge in 1919 by Henry Hollond, who later became the Rouse Ball Professor of English Law, Goodhart became a Fellow of Corpus Christi and University Lecturer in Law. He remained at Cambridge for ten years, during which time he help found the Cambridge Law Journal, and also became editor of the Law Quarterly Review. His academic career was crowned by appointment to the Chair of Jurisprudence at Oxford in 1931, a position he held for twenty years, before becoming Master of University College, where he stayed until he retired in 1963. Arthur Goodhart was an eminent scholar of the Common Law and in Jurisprudence, but there was more to his career than just ability and endeavour. He was inspired by the common heritage of the US and English legal systems, and he carried this unstintingly into his extra-mural life by promoting good relations between the land of his birth and his adopted country. 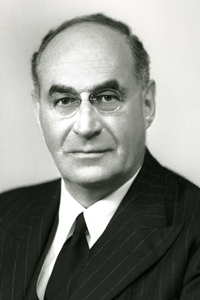 For his efforts during the Second World War (when he spent most of his time in England), he was given an honorary knighthood in 1948, having already become the first US-born citizen to be appointed King’s Counsel (1943). His Mastership of University College was also a first at Oxbridge. Through his family, he also projected his private life into the public domain. His wife Cecily was English, and his three sons have all followed careers that have embraced elements of public service: Sir Philip Carter Goodhart was a Conservative MP from 1957-92, Lord William Goodhart, a Human Rights lawyer and vice President of the ICJ, sits as a Liberal-Democrat in the House of Lords, and Charles Goodhart (author of “Goodhart’s Law”, advisor to the Bank of England and who was at Trinity College), is a Professor at the London School of Economics. The day Arthur Lehman Goodhart sailed from New York for the first time to England was a significant date in the histories of the law faculties at Cambridge and Oxford, and the annual appointment to the Chair of the Arthur Goodhart Visiting Professor of Legal Science in our Faculty is continual recognition of this and the illustrious career that ensued. The first American to hold the post had, in fact, been British born. Judah P. Benjamin, after a stint as Secretary of State for the Confederacy, returned to England in 1865 to reclaim British citizenship, and was made Queen’s Counsel in 1872 (see Time Magazine July 1951).